Detailing the sales figures for each brand, the AEA has released its market share report for 2016. Fendt saw the biggest jump in sales of any tractor brand in 2016, according to AEA figures. While the top four brands all reported downward trends in 2016, the largest of which being John Deere, the likes of Fendt saw a jump in sales, leaving them and Kubota nipping at the heels of Massey Ferguson and Case IH in third and fourth place respectively. 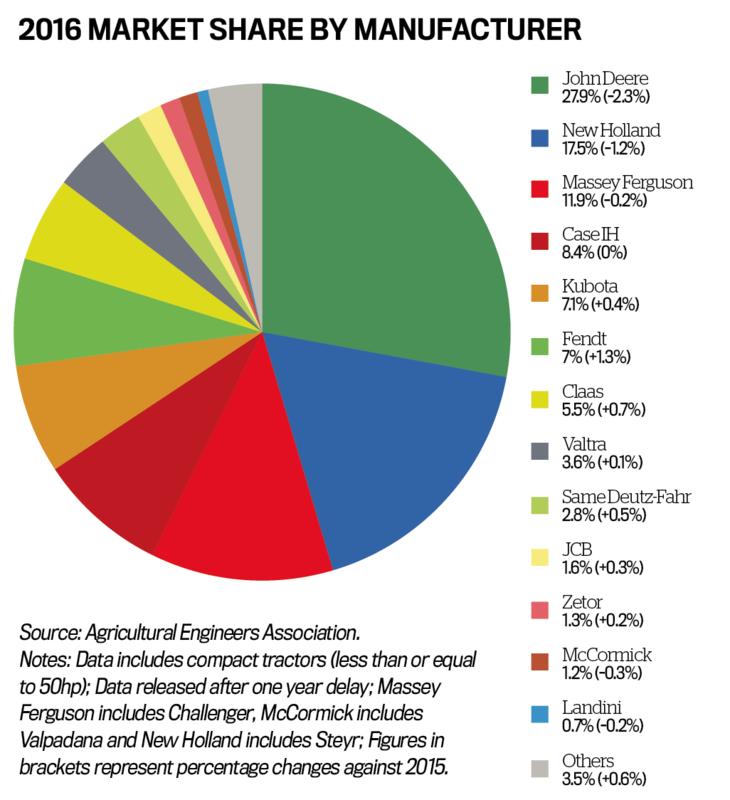 Due to EU law, the Agricultural Engineers Association (AEA) can only release the UK tractor registration breakdown 12 months in areas, meaning we will have to wait until next year to see the full breakdown of sales for 2017. According to the association, tractor sales above 50hp in 2016 recorded 10,602 units, a decrease of 240 from 2015. This is however only a small reduction compared to the 1,591 drop seen from 2014 to 2015. And it was not only the Bavarian firm bucking the trend; Claas gained an extra chunk of market share by selling 84 more units than in 2015, with Same Deutz-Fahr, JCB, Zetor and Valtra also managing to pick up a few extra sales. Fendt’s national sales manager, Martin Hamer, believes altering sales strategies is helping them up the table. “Our dealers switched from a salesperson selling all brands, to ones which specialise in Fendt or Massey. This means they can better understand how our products work and better translate it to customers, which I think is paying dividends for Fendt.